Newly launched online is the Jo Malone My Wanderlust Collection - I'm almost certain it goes on counter in very early January should you want to test the range in person. A collection of five new and limited edition products designed by Jo Malone's Style Editor, all of which have been inspired by her memories of exotic locations. "The expansive Atlas mountains. Fragrant Mediterranean hillsides. Dusky Caribbean evenings. The Australian Outback, rich and golden. And green box hedge in an English garden. The spirit of place, captured in this limited edition collection." I was very kindly sent the utterly divine Jo Malone Cardamom and Moroccan Rose Home Candle, from the moment I laid eyes of the packaging I knew it would be love. Heart eye emoji love. Too far? Probably but isn't there something dreamy about the peachy/pink watercolour gradient design? It hints at a setting sun and the warm glow of a summer evening - something a Scot like me in late December can only dream of. Funnily enough the notes used to create the scent have been selected to evoke a warm glow within the home. 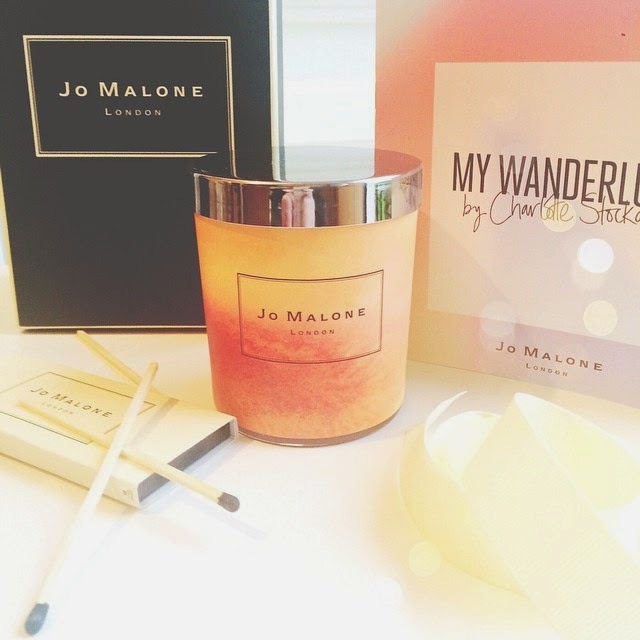 "Jo Malone Cardamom and Moroccan Rose Home Candle; The foothills of the Atlas mountains. Moroccan roses unfurl with their sumptuous honeyed spice. Glowing, aromatic cardamom. Freshened by the brightness of ginger. Chamomile, natural and earthy, accentuates voluptuous floral facets. Expansive, bright and opulent." In my opinion Jo Malone Cardamom and Moroccan Rose Home Candle is the perfect balance of rose and spice, a strong and heedy scent that is oddly relaxing, uplifting and quick to fill a room. If like myself you are not typically a spice and/or rose fan this is one of those rare concoctions in which the overall fragrance may result in you changing your mind. The often powdery trails of rose are cancelled out thanks to the bright, zingy note of Ginger - couple that with soft and soothing Chamomile and you have an entirely original scent composition. A beautiful addition to any room. Jo Malone Cardamom and Moroccan Rose Home Candle £42 via Jo Malone - link. Oh wow, that candles looks absolutely gorgeous! I'm such a fan of Jo Malone, I can't wait to smell this! I'm super jealous you have one already! And the heart eye emoji is definitely necessary! This candle looks so gorgeous!! i'm definitely jealous! i'm obsessed with candles and these new jo malone make me so curious. especially Australian outback.